Where is it? 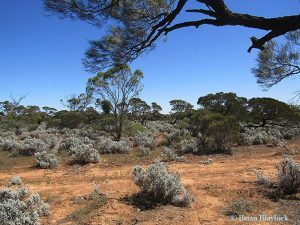 : The park is 10km north of Whyalla, adjacent to the Lincoln Highway. History: The park was first proclaimed as Whyalla National Park on 4 November 1971. 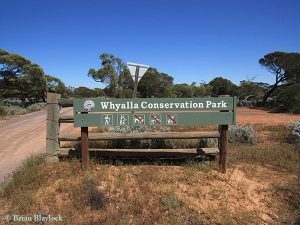 It was reproclaimed as Whyalla Conservation Park on 27 April 1972. Allotment 1 was added to the park on 11 December 2003. Habitat: The park is roughly divisible into two sections. The eastern plain with Western Myall (Acacia papyrocarpa) as the dominant species with some Sugarwood (Myoporum platycarpum), Bullock-bush (Alectryon oleifolium) and Native Peach (Tantalum acuminatum) and Black Oak (Casuarina cristata). The understorey is mostly Bluebush (Maireana sedifolia) and Bladder Saltbush (Atriplex vesicaria). The western portion is dissected by a series of low lying hills supporting Narrow-leaved Fuchsia Bush (Eremophila alternifolia), Lobe-leaved Hop-bush (Dodonaea lobulata) and Rock Side (Sida calyxhymenia). The most outstanding topographic feature in the park is Wild Dog Hill (90m), in the north-west corner, a sandstone outcrop rising abruptly from the plain. Common Species: White-winged Fairywren, Purple-backed (Variegated) Fairywren, Spiny-cheeked Honeyeater, Singing Honeyeater, White-browed Babbler, Crested Bellbird, Grey Butcherbird.